Burlington's innovative furniture ranges are sure to add style and sophistication to any traditional setting with its elegant designs. 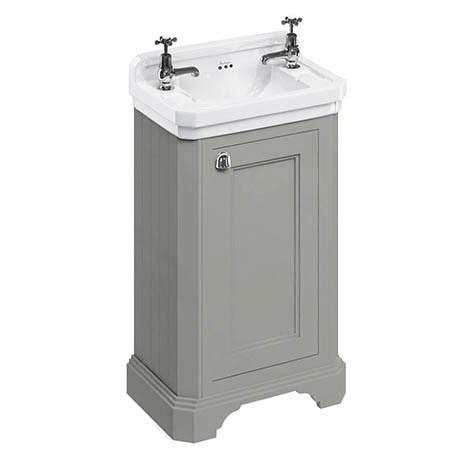 This unique and stylish vanity unit is perfect for any cloakroom or bathroom space and offers plenty of storage capacity. The unit features a soft closing reversible door with stylish chrome plated metal handle while the ceramic Edwardian basin comes with two tap holes and overflow. Each unit is coated with 5 layers of ultra-violet stabilised primer to prevent colour fading, it is then painted with a top coat from a range of stunning finishes. Please note: Taps and waste not included.